I wanted this skirt to be a wrap. I really did. And dam it all, I still do. I just didn’t have enough fabric. 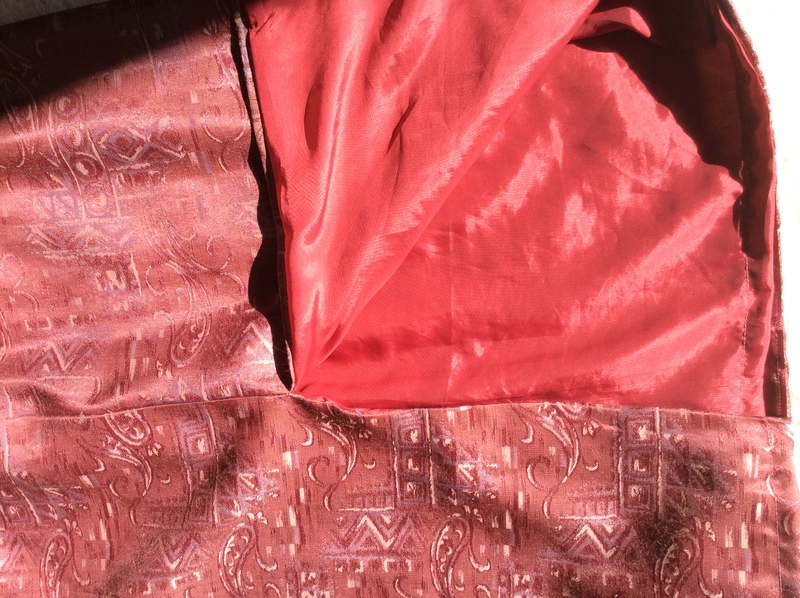 I’ve had this piece of gorgeous silk for about a year, having picked it up for a couple of bucks as a roll-end of about a metre, and from time to time I’ve wrapped it around my waist just to admire it and contemplate how perfect it would be as some type of wrap or sarong-like skirt. I bought a wrap pattern that I thought might work, but horrors, there wasn’t nearly enough fabric. I thought the pattern I used for the Olivia Wrap would work, but nope. Finally I decided to use the yoke from the Olivia Wrap pattern, and simply sew the rest of the fabric into a tube, gather the top and attach it to the yoke. Simple, but with gathers that could catch the light. It’s not bad, but I find I’m still wishing I could have made it into a wrap. Even with this design, I had to use the fabric against the grain rather than with it, because the piece was wider than it was long. But it drapes as nicely as if I’d used it “properly”, so I’m happy with that. I decided to line this puppy with some wine coloured silk I had left over from my stay in Beijing in 1980. As you can see, I also left a side slit — that was purely so that I could walk comfortably without having to shorten my stride. I then discovered the problem with lining a skirt that’s fuller than a pencil skirt but has a side slit. The lining just wants to hang out the slit. I had to tack it to the hem for a few inches on either side. 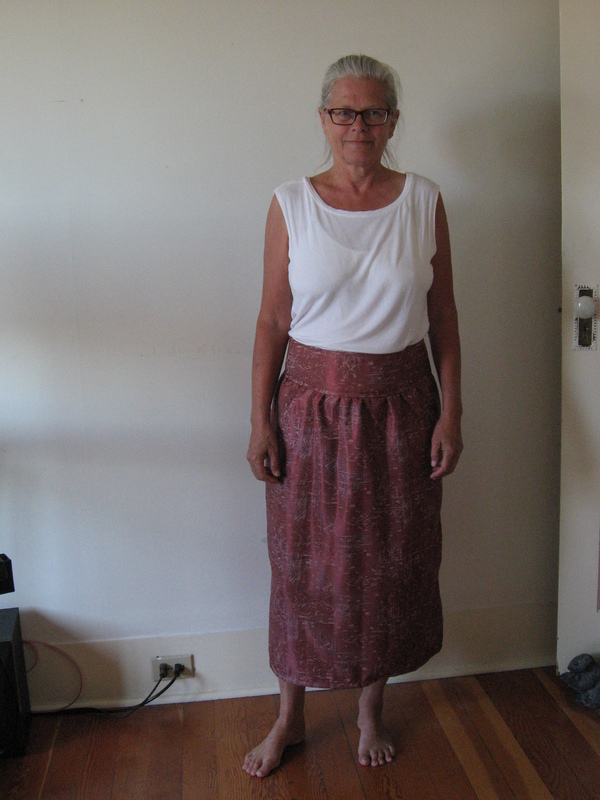 I made an invisible zip for the first time with this skirt. For that, I had to read the instructions, put them away and … meditate, clear my mind, do a few mantras until suddenly, I knew what to do. Ta da. Unfortunately the zip is not totally invisible when I’m wearing the skirt. I think because it’s a side zip, the yoke pulls open a bit when worn, revealing what’s supposed to be a stealth closer. Poo. I don’t have anything to wear with this skirt, though, and that’s a problem that I’m finding with a few other “bottoms” that I’ve been making too. 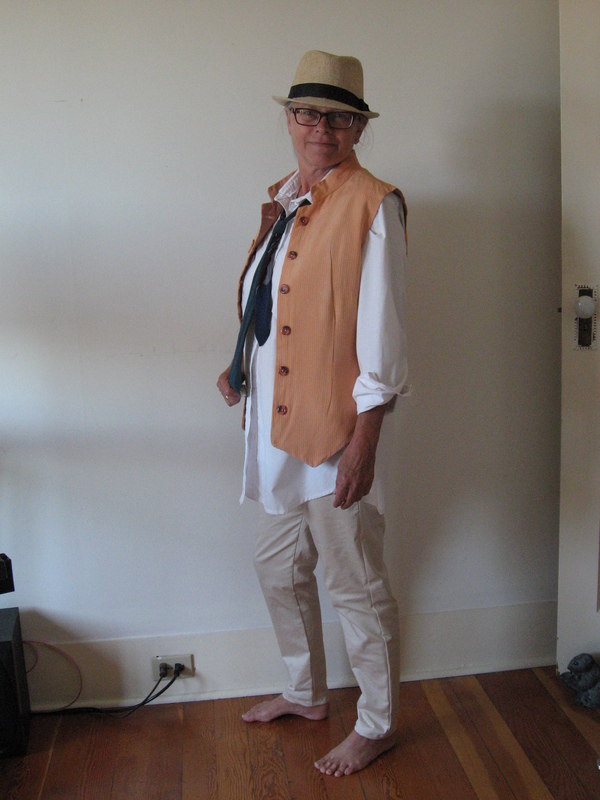 Since I took up sewing a few years ago the only tops I’ve made have been baggy, oversize blouses and tunics that I can wear with skinny pants or leggings. Turns out they look awful with full or gathered or baggy bottoms. So now I have to make some more fitted tops. It seems like the more variety in your wardrobe, the more variety you need. Gaa! 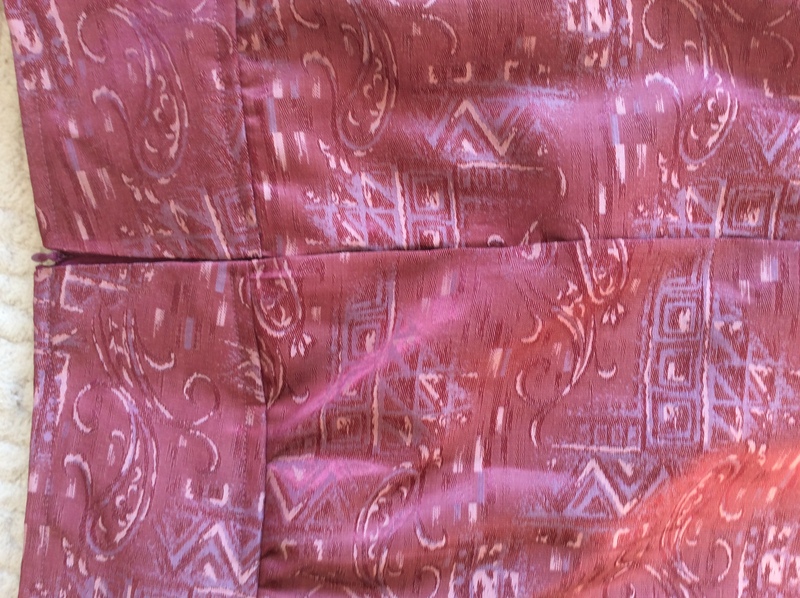 Anyway, this skirt is a little more formal that I usually wear, but that’s to be expected with this fabric, I think. It’ll be great for any dressier occasion at any time of year, and will look as good with tall boots as with sandals. It could be in my closet for years. And I’ll probably be a lot more excited with it when I get something to wear on top with it. If anyone would like to point me to a nice fitted top, please do. That’s such a boring title for this post, but I seem to be stumped. 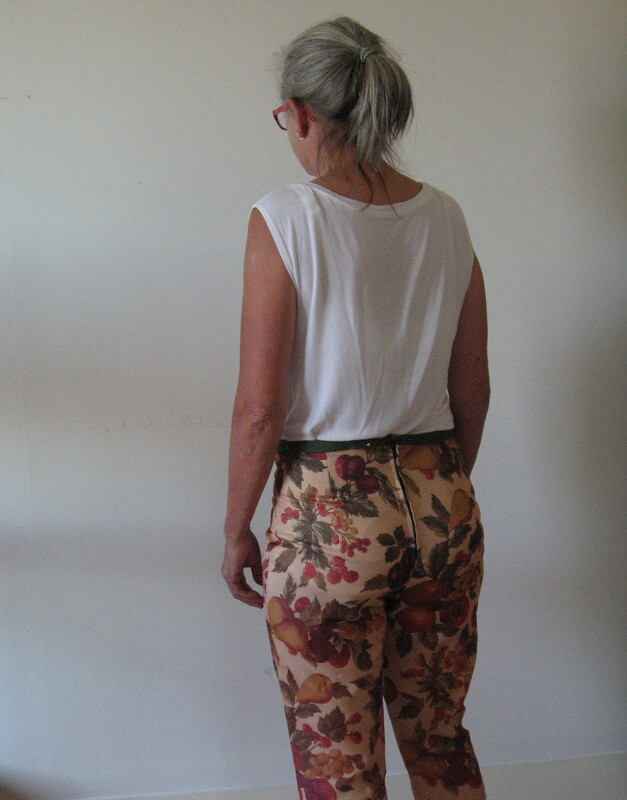 I decided it was time to revise a pattern I made from a pattern block, which I’ve been calling “my favourite tight pants”. 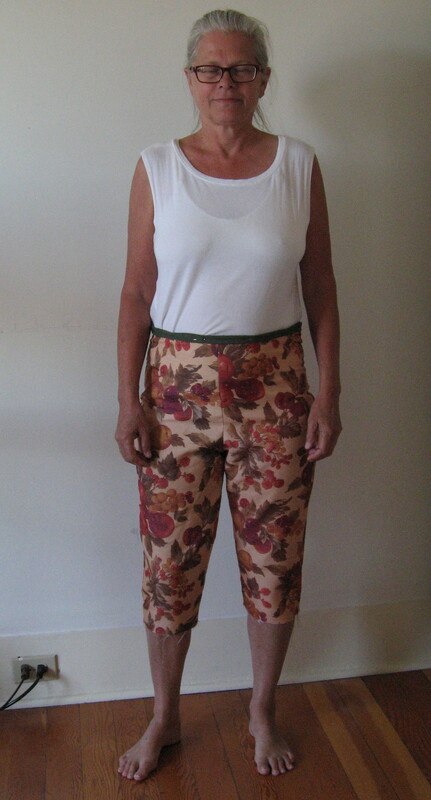 It’s worked pretty well — I’ve made three pairs of front-fly pants from it, two of them with front pockets. But I’d been gradually cutting down the front waist and had finally gone too far, and I also wanted to make the legs skinnier. I thought I’d make a great wearable toile out of an old tablecloth someone gave me (that exit party again). I love the floral print, and the fabric had a really nice old and worn feel to it. So I redrew the pattern, deciding this time to just put in a back zip. I’m always going to wear tunics and long tops with it, so why bother with front detailing? Oh shoot, this is an “om” pic. Oh well. You’ll notice from the pic that I didn’t finish the toile (see the pins in the waist facing?). This is because I sat down in them. (That’s the big test with tight pants, right?) Big problem. This fabric has no give whatsoever. None. Zip. Not with the grain, across the grain, or on the bias. Not a millimetre! So, it’s totally unwearable. Boo hoo. But I did confirm that the pattern works with the new adjustments; I just needed fabric with some give. I decided to try something with 2 or 3 per cent lycra, which I have neither worked with, nor worn (except back in the ’80s when I had a pair of stretch jeans). I cut the fabric to the same size as the toile, but discovered I wanted to take the legs in a bit more. I used a really heavy twill for the facing and when the back gaped open a bit I added two smaller darts on either side of the zipper. I’m going to try that again I think, rather than always taking in the back seam. 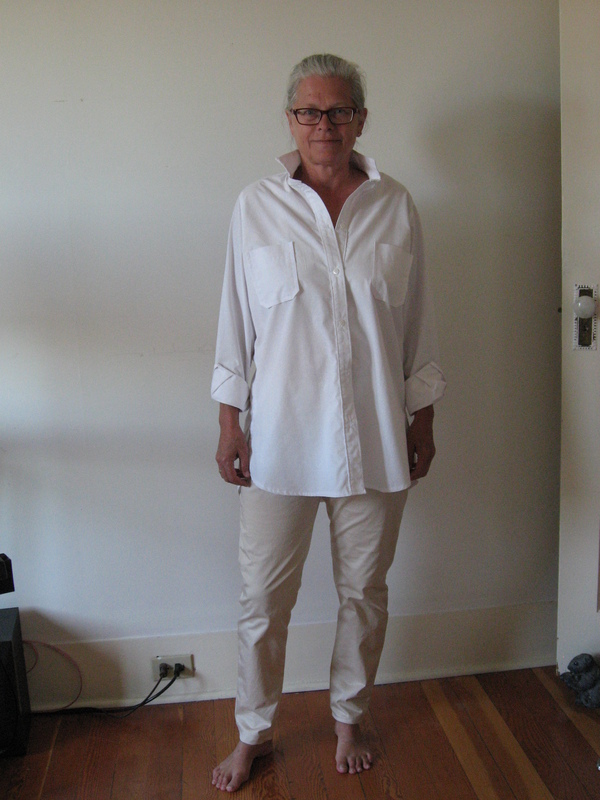 Here I’ve paired it with a white cotton shirt I made from burda6908. I like white and beige together. Isn’t this a classic look? I feel so …. very …. Audrey Hepburn wearing this combo. This shirt is meant to be oversize, and the pattern offered three collar variations. I love the narrow, short-pointed version. I can wear the collar up without feeling like I walked out of some seventies tableau. I think this is a “quietly” feminine look, but I can take it just “masculine of centre” really easily. How I love androgyny. Even though I’m trying to widen the scope of my wardrobe, I do love looks that can swing both ways — a little feminine, a little masculine. 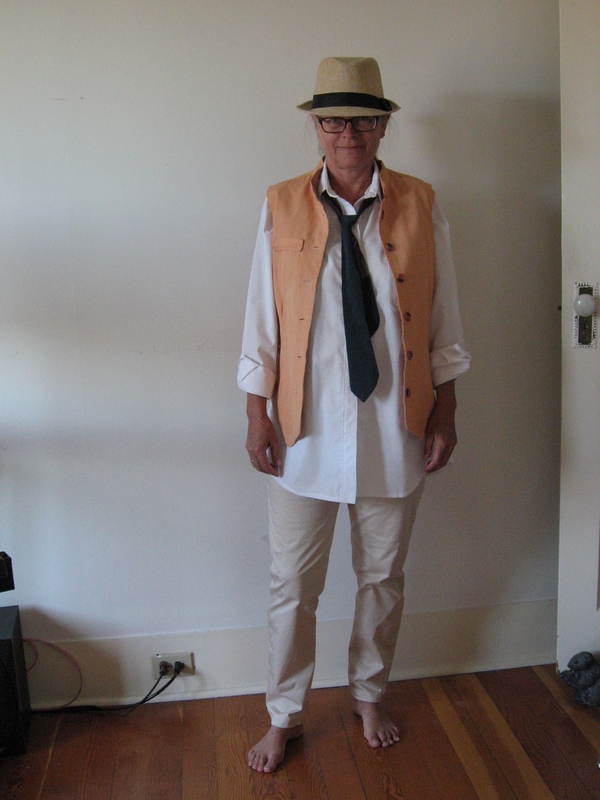 That vest is also self-drafted (I used a couple of shirt patterns), and the tie (pure silk) is pure Sally Ann. Oh, the hat, I bought it at a yard sale across the street the same day I took these pics. The owner assured me she bought it in New York.